The Trackless MT7 Municipal Tractor leads the market in technological design, efficiency, safety features, operator comfort and overall performance. Designed to do the job safely and efficiently, take a look at all the Safety Features the MT7 has to offer. • Leaving the seat shuts down the attachment whether it is PTO or hydraulically powered. • Leaving the seat shuts down the engine, if the tractor is not in neutral. • Full-colour backup camera viewed in the digital dash when in reverse. Three rear view mirrors also standard. • External Up/Down Switch on the front of the tractor to move hydraulic cylinders into position when pinning up to an attachment. 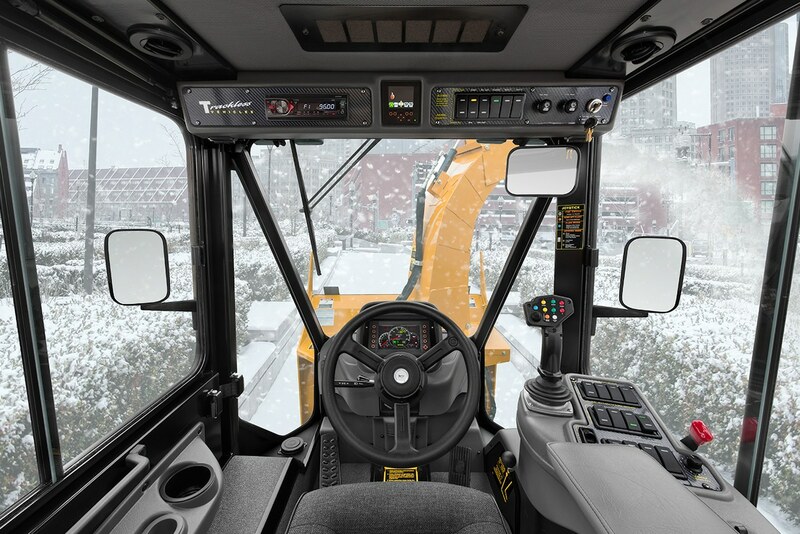 This eliminates the possibility of someone losing a finger due to a second person in the cab trying to move the cylinder hydraulically while not being able to see where the other person’s hands are. When using the switch, the cylinders move at 1/3 the regular speed giving precise and safe control for aligning the pins. • Ability to drive the tractor into the attachment for hooking up, without a second person between the attachment and tractor holding up the mounting frame or PTO shaft. To accomplish this, both the pushframe and PTO shaft are supported at the correct height for driving the tractor forward into the attachment. • Ultra-Brake System. The tractor brakes by way of the hydrostatic transmission but if the service brake pedal is depressed not only does it apply the service brake system, it triggers the Trackless Ultra-Brake System. This system changes the deceleration ramp of the hydrostatic transmission to become much more aggressive. This advanced performance feature is one of the most important safety features to be taken into consideration, when comparing to a competitive product, due to the possibility of a child playing in a driveway and suddenly running out from behind a pile of snow at the end of the driveway as the tractor and plows or snowblower is approaching at up to 19 km/hr (12 mph). The unit must be able to stop suddenly and in the shortest distance possible by way of the operator’s natural reaction of simply applying the brake pedal. The Trackless UltraBrake System was designed specifically for this reason. • Totally enclosed exhaust/after-treatment system eliminates the possibility of someone accidentally getting burned. Not only is it totally enclosed, there is no need to remove the side panel covering it because of all daily checkpoints, battery cut-off switch, breaker switches, remote battery terminals, air breather access, oil filters, fuel filters, etc. are on the left side. It is not only more convenient to have everything on the driver’s side but it is much safer to keep everyone away from the hot components that make up the after-treatment system.